Background Appropriate patient selection and optimal timing of dialysis initiation among older adults with advanced CKD are uncertain. 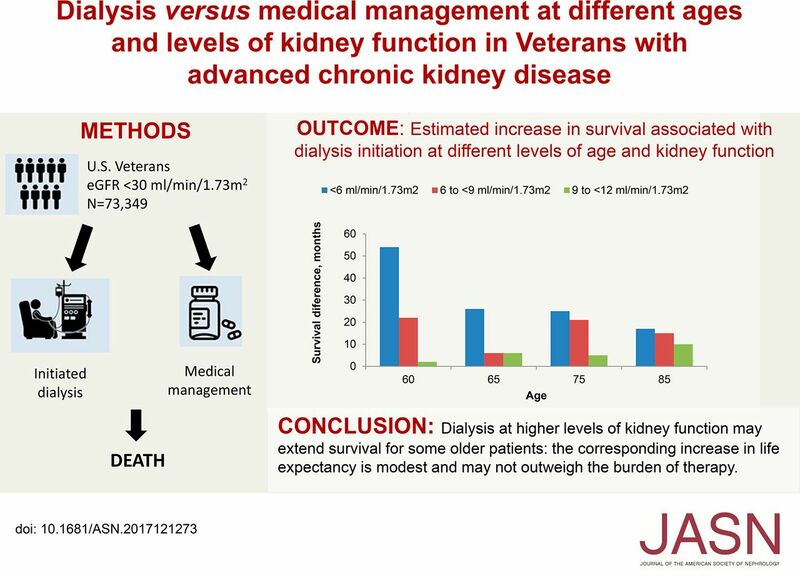 We determined the association between dialysis versus medical management and survival at different ages and levels of kidney function. Methods We assembled a nationally representative 20% sample of United States veterans with eGFR<30 ml/min per 1.73 m2 between 2005 and 2010 (n=73,349), with follow-up through 2012. We used an extended Cox model to determine associations among the time-varying exposures, age (<65, 65–74, 75–84, and ≥85 years), eGFR (<6, 6–<9, 9–<12, 12–<15, and 15–<29 ml/min per 1.73 m2), and provision of dialysis, and survival. Result Over the mean±SEM follow-up of 3.4±2.2 years, 15% of patients started dialysis and 52% died. The eGFR at which dialysis, compared with medical management, associated with lower mortality varied by age (P<0.001). For patients aged <65, 65–74, 75–84, and ≥85 years, dialysis associated with lower mortality for those with eGFR not exceeding 6–<9, <6, 9–<12, and 9–<12 ml/min per 1.73 m2, respectively. Dialysis initiation at eGFR<6 ml/min per 1.73 m2 associated with a higher median life expectancy of 26, 25, and 19 months for patients aged 65, 75, and 85 years, respectively. When dialysis was initiated at eGFR 9–<12 ml/min per 1.73 m2, the estimated difference in median life expectancy was <1 year for these patients. Conclusions Provision of dialysis at higher levels of kidney function may extend survival for some older patients.